Amid strong global demand for the world's first affordable mass-produced, zero-emission vehicle, Nissan International SA will open order books today for Nissan LEAF in Portugal and the Republic of Ireland. Nissan's additional lead market for electric vehicles in Europe, the UK, has also confirmed that pre-orders will commence on September 1. The ordering process is a first step in securing a place on the list to receive the ground-breaking Nissan LEAF and means Portuguese, Irish and British customers will be first in line to receive the car in Europe when it launches early next year. 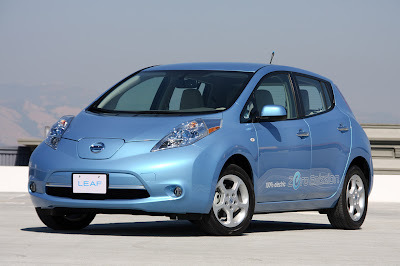 Nissan LEAF deliveries begin in Portugal in January, Ireland in February and the UK in March. "Today's announcement brings zero-emissions motoring one step closer to reality in Europe," said Simon Thomas, Senior Vice President of Sales and Marketing at Nissan International SA. "Nissan LEAF will appeal on many levels; it's a completely zero-emission electric car with all of the financial and environmental benefits that will bring, but it is also a practical family size car and fun to drive. That's a powerful combination, and Nissan LEAF is already attracting significant interest from prospective customers." Since March, nearly 12,000 customers in Europe have signed up for regular updates on Nissan LEAF's introduction, and in the US and Japan pre-orders have exceeded 23,000 units since online reservations began in April. Such high demand has meant the Nissan LEAF will launch slightly later than planned in the Netherlands. Sales are now expected to start in June 2011, with pre-orders opening to customers in October this year. All other market launch dates remain unchanged. To make a reservation, customers in the initial launch markets simply need to go to their local Nissan consumer website* and place their order. The quick and easy process requires a fully-refundable deposit of €300 (£257). These 'early adopters' will also be given an opportunity to test-drive Nissan LEAF thoroughly by December, at which point they will need to formally confirm their order. A dedicated call centre for each country has been created to assist customers with questions. Call centre details are available on each website. The price of Nissan LEAF after government incentives is €30,250 in Portugal, €29,995 in Ireland and £23,990** in the UK including the battery. This means that despite its advanced technology, Nissan LEAF will be no more expensive to buy - and considerably cheaper to run - than a conventional compact family hatchback. Running costs are anticipated at less than €1.05 per 100 km in Portugal, less than €1.20 per 100km in Ireland and less than €1.59 per 100 km in the UK. Nissan LEAF is fully equipped with features such as air conditioning, satellite navigation and a parking camera. Innovative smart phone connectivity will allow an owner to heat or cool the interior of the car remotely via a mobile phone. The car's AC motor develops 80 kW of power and 280 Nm of torque, enough for a maximum speed of more than 140 km/h (90 mph). The electric motor is 'fuelled' by a laminated lithium-ion battery with a power output of more than 90 kW. A full charge delivers a potential range of 160 km (100 miles - US LA4 mode) which will satisfy the daily driving demands of most customers. Global research indicates that the average daily mileage for 80 percent of the world's population is under 100 km: the figure in Japan and the UK is under 50 km for 80 percent of the population.